One day in early February I got a surprise in the mail: a package of delicious yarn I hadn’t ordered for myself! Along with the two balls of yarn was an explanation: they were yet-to-be-released lines of Knit Picks yarn, and I was welcome to play around with them to my heart’s content, but if I could provide a free pattern to go along with the release, that would be wonderful! And wonderful it was; both yarn lines are fantastic, and I was so privileged to have the opportunity to test them out ahead of time! The first yarn line, which was released just two weeks later, is Muse, an Aran-weight hand-painted washable Merino that is just gorgeous and so incredibly soft. I love this yarn, and I’ve already ordered myself some more for a new pattern. The second line should be released any day, so I won’t say more about it other than it is also AMAZING and I LOVE IT. Now unfortunately I didn’t get my first pattern submitted in time for the release, but since I spent the time to write it up, I’m offering it for free on my own Ravelry site. Here it is: The Bristol Diagonal Ribbed Hat! 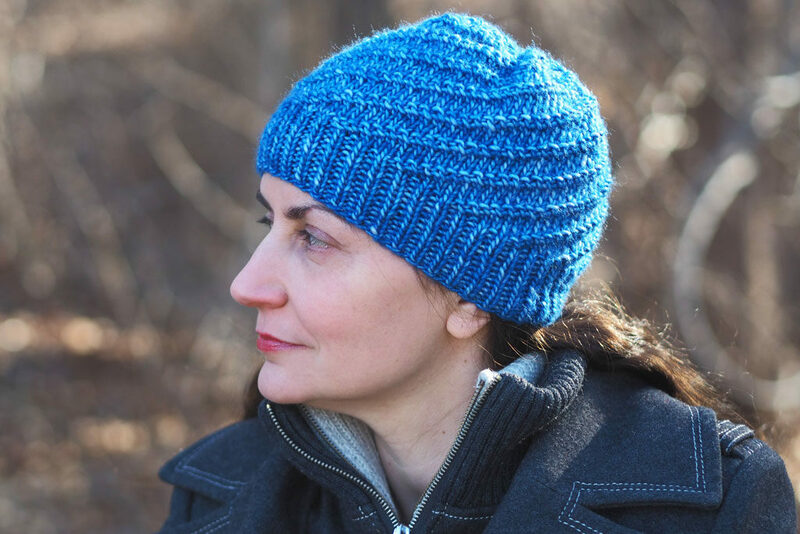 The hat is very simple to make, with a six-stitch pattern repeat of simple knits and purls, and the most basic decreasing at the crown. 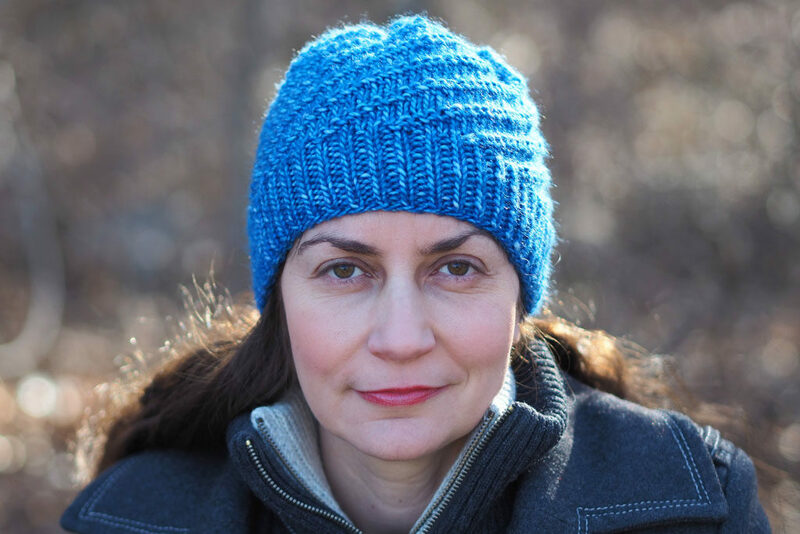 It is a great hat for a beginning knitter. I only worked out measurements for one hat size (adult small/medium or 21″ head circumference), but I give suggestions for making a larger or smaller hat. The pattern’s hat size takes precisely one hank of Muse yarn (with very little to spare), so it’s not hard on the wallet. If you want to be more playful, you could add a faux-fur pompom to the top! The yarn I was sent and which I used to make the hat is the Visionary Tonal colorway, a rich brilliant array of blues with some undyed natural color peeking through. I love it! 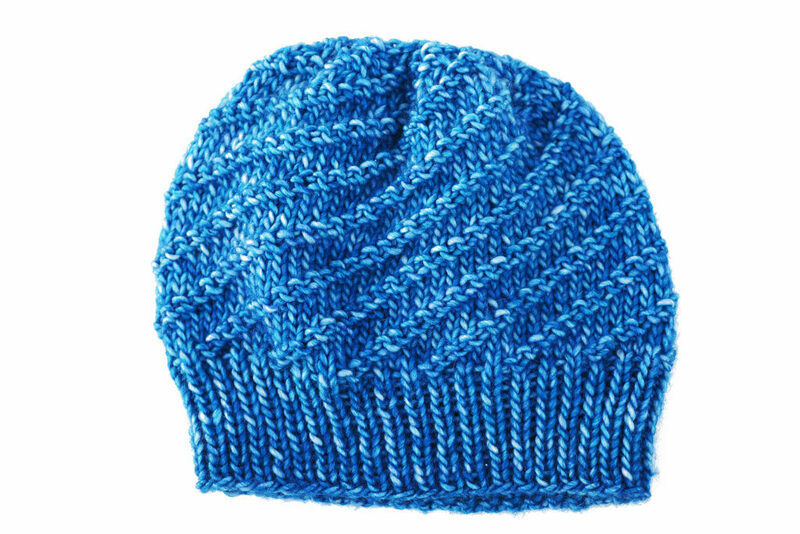 All of the colors are gorgeous, and the subtle diagonal ribbing on this hat will work well with any of the colorways. This is a super quick knit in Aran weight wool, so go download the pattern and give it a try! And keep your eyes out for another free pattern coming soon!